Welcome to the website where you can find out all the required information about Weedeater Featherlite garden tools in case you are planning to buy one. Weed Eater, a famous string trimmer company offers variety of accessories for cutting the lawn. There is a special series of trimmer products specifically named “Featherlite”, referring to a lightweight and inexpensive device. The gas or electric trimmers and a leaf vacuum from Weedeater are the right choice because the lighter weight won’t tire you out so quickly and tools are professional quality. Typically, low price comes with low quality, as in the case with some Weedeater Featherlite line trimmer machines. We have tried to highlight the most important advantages and disadvantages of each model in the following paragraphs. The W25 series stacks four different combinations of weedeaters to allow you to choose the best one that suits. The combinations include two straight shaft where one has a fixed line head and the other has a Tap’n Go system. The other two weedeaters are curved shafts where again one has a fixed line head and the other has a Tap’n Go system. The W25 series all have the exact same 2-stroke 25cc engine. You can compare all the W25 weedeater models here. Reviews are generally good for the W25 series as it stacks a powerful engine, wide cutting path and the combination of straight vs curved shaft and fixed verses Tap’n Go head. It is these options that are proving popular amongst consumers. The entire range weights from 9-10 lbs. depending on the model. Some people have stated that they like the curved shaft range W25CFK and W25CBK because they are lighter and are the best replacement for the older popular weedeater featherlite FL20 and FL20c models. Whereas many lawn enthusiasts are recommending the W25SBK and W25SFX models as an appropriate replacement for the older SST25 and SST25CE models. The Weedeater has two Featherlite FL trimmers with 20 cc and 2-cycle gas engine: FL20 and FL20C. The FL25 is a more powerful model. Small price and weight, considering the actual power that these gas trimmers can produce, make it a good shopping choice for maintaining your lawns and gardens. A curved shaft for easier control and Tap’n Go trimmer head contribute to an overall impression. Weedeater FL20C weights 8.8 lbs (4 kg) while FL20 is little bit lighter. Dimensions of the model FL20C are 33×10.8×10 inch which is 83x27x25 centimeters and 54.4″ or 138 cm for prolonged product FL20. Cutting path in which the string moves is 15″ inches in diameter. Reviews are ambivalent when talking about FL20C or FL25. Generally, people are satisfied with lawn trimmers because of an economical purchase that simultaneously has acceptable quality, while some believe that the device is not worth buying. Since they are cheap, these FL20 class weedeaters aren’t recommended for larger jobs. It is not wise to spend money on repairs or replacement parts, new trimmer costs as much as parts and shipping. In the other case, you should consider buying a quality trimmer for your lawn. When buying a Weedeater Featherlite over the Internet, there is a small chance that some parts are broken while shipping and the problem occurs when returning the device. Some customers highlight the difficulties when trying to start while others say it runs good. More than a few pulls is needed to start the engine first time and it’s necessary even for further use. According to some reviews, the mixture of oil and gas should be 1 to 50 since the one written in the instructions may not be able to start the Weedeater. All in all, the Weedeater Featherlite gas trimmers will give you what you expect for about 60 bucks. Weedeater Featherlite SST25 and SST25C have a bit stronger engine, 25 cc and 2-cycle. An elongated straight shaft has available Fixed line or Tap ‘N Go Dual Exit trimmer heads with 17″ cutting path. Both Featherlite models are about 10 lbs (4.5kg) heavy, which is relatively small for a gas trimmer. Weedeater FLSST25 is 63.8″ (162 cm) long and FLSST25C is the shorter one, 40 inch or 1 meter long. This series of Featherlite is enough powerful machine to cut high weeds and grass. An experienced cutter used a gardening tool and labeled it as valuable for its price in review. Once in a while, string trimmer will make troubles when starting. The constant need to pull easily irritates gardeners so they mark it as junk, despite the small budget they gave. Low durability categorizes SST25 lawn trimmers as less advisable choice for demanding tasks. However, if you properly deal with it, Weedeater will certainly fulfill its purpose. Cutting line for FLSST25 may be the problem when replacing. Reviews recommend buying a new spool instead of rewinding the old one. 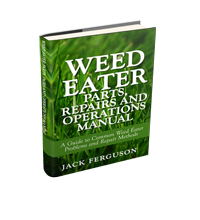 Fixing is also not recommended since Weedeater replacement parts are hard to find. A bump feed frequently won’t supply enough string which makes work difficult. Lightweight and an elongated straight shaft meet the needs of the average customer. It’s more comfortable to manage with straight than curved shaft when using the trimmer as an edger. Carrying a lawn trimmer isn’t exhausting and does not burden the spine when trimming your yard. Weedeater RTE12C, RT112C and RTE115C are lightweight electric trimmers with similar specs and we’ll present them in the same section. Powered by 3.7 or 4.5 Amp motor, which makes them a total weight of only 4.1 pounds or 2 kilograms (5.9 lbs or 2.6 kg for RTE115C) and allows electric equipment to get an important advantage. This series has a different type of head, automatic feed-head Cetrex, while the previous two have a standard Tap’n Go Advance System. Length of Weedeater’s pole is 45 inches or 1.15 m. Cut path for RTE12C and RT112C is 12″ and the third product has an elongated, 15 inch long cutting path. These Weedeater models are not factory officially named Featherlite, but since weight classifies them as ultra-light electric lawn trimmers, they are considered to be such. The cutter can simply switch from a Weedeater Featherlite trimmer to edger by pushing a button and lawn edges with ease. Electric power is really refreshing after the noise, gasoline, vibrations and difficulties when starting, typical for gas trimmers. This gardening tool powered by an electric current will start up in a seconds but you will have to pull the power cord across the lawn. Don’t be disappointed if Weedeater Featherlite does not meet your expectations, for an affordable weed trimmer there’s no better choice. The economic cost doesn’t go along with the guarantee of quality and long lasting. Replacing the string or assembling the device generally causes misunderstandings in most cases. Watch some video tutorials or read few articles before, it helps a lot. The nylon line will sometimes be too short and occasionally too long. The plastic cover is prone to cracking what’s actually expected for a Weedeater worth $40. Be careful to prevent it happening. An Extreme series of Weedeater Featherlite that will show extreme performances if you are going to use it to tackle the weeds on your lawn. Characterized by the same engine like previous cutting machines, curved shaft for better handling and 16″ cutting radius, a wide range of trimmers is available for selection. Some of them are: FX25, FX25LE, FX26, FX26S, XT10, XT12, XT20, XT85, XT95, XT100, XT110, XT110S, XT112, XT114, XT115, XT200, XT260… Weight and dimensions do not differ much from other string trimmers. Whichever Weedeater Featherlite Extreme you choose, XT25, XT200 or XT260, job is almost fun when using these products. Ratings on retail websites scored the best grades of quality in comparison to already mentioned trimmers. Not too many problems when starting and ease of use are the main characteristics of Weedeater Extreme, but there is deficiency related to the adjustments associated with the choke and carburetor. Ergonomic design and weight won’t cause tiredness while you cut the grass. Of course, breakdowns will always be there but not so present as with the other gas trimmers. Weedeater FL XT200 or XT260 may run on half choke, which is actually great for a light duty trimmer. The carb adjust is needed if there are troubles like trimming at idle. XT114 is an electric version also available on market. Weedeater FL1500LE is a leaf blower with 23cc 2-Cycle gas engine. The air speed of 150 miles per hour and a smoother engine with less vibrations can be additionally adjusted with a variable speed throttle control. These beneficial features make gardening more comfortable. The noise level can exceed 68 dB(A) so you should wear hearing protection. With less than 8 lbs or 3.5 kilos, lightweight FL1500LE is an excellent choice for blowing leaves in the garden. A conclusion when reading customer reviews; the device may easily satisfy your requirements for quality work because people are very pleased with this unit. In case you decide to shop for Feather-light Weedeater FL1500LE gas blower, read critiques first and compare it to the models from other companies. The most prominent problem is the snap back of the pull cord. On other hand, an affordable cost and the fact that a leaf blower isn’t much loud make this gardening tool a great opportunity for purchasing. When using a Weedeater Featherlite in the fall as a powerful leaf vacuum, you will be surprised how quickly and effectively it fills the bag with the leaves sucked by the machine. With this featherweight Weedeater, work in the yard will be completed in a few minutes! When choosing the type of engine, you should take into account the environment and size of the lawn. You should be aware of the fuel mixture of a petrol-driven engine because if gas becomes supersaturated, the trimmer won’t start. Although the recommended oil ratio for 2-stroke engines is 1:40, users of these devices are advised to use lower, 1:50 ratio at which all Weedeater Featherlite models are easier to start. If that’s not enough, then the problem is caused by the defective parts such as the gas line, primer bulb or throttle cable and one of them needs replacement. Weedeater Featherlite occasionally has troubles with operating speed when it’s difficult to adjust the choke properly. That’s pointing out problems with the carburetor. Fuel tank is sufficient for several hours of trimming. Pull cord sometimes does not retract and replacement of the mechanism is required. These trimmers will create a lot of noise when operating and an alternative is an electric trimmer. It turns on easily with the trigger, easier to maintain and handle, virtually silent, but pulling the cable constantly may not always be a viable option and represents an issue if you have a large garden. Reviews show that even electric Weedeater’s shaft is loosely constructed and prone to breaking into two pieces. The part where the string head connects should need be tightened more, from time to time if you plan to mow or edge. For the most demanding gardeners Extreme or Plus series are recommended or even some long reach hedge trimmer. The trimmer line usually becomes worn, so the purchase should include additional spool line altogether with Featherlite model. How to replace trimmer line is described on other page. 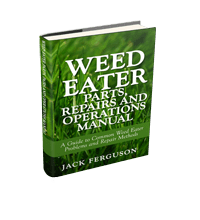 Use this troubleshooting guide when repairing, but never do any repairs of Weedeater parts because all have a really low cost. It simply is not worth of repairing. As an attachment with your Weedeater Featherlite you will get the owner’s manual. Recall on warranty that comes with the unit at the dealer or shipping company if you need some serious help. Read more and consult on our forum/message board. All in all, for a light-duty trimmer, with respect to the price and power, Weed Eater is a great choice!